“Do not give up, Do not get bored, Do not stop,” screamed the title of a motivational video on the Facebook page of the April 6 Youth Movement. The movement, which emerged as one of the main players in the Egyptian revolution, accompanied the video with an invitation to the “Save the Revolution Friday” million man march on 1 April. The purpose of the event, they say, is to press on with the rest of the revolution’s demands, rid Egypt of the “institution of corruption” with all its figures and symbols and to challenge the counter-revolution initiated by the old regime which, they say, is playing behind the scenes to end the Egyptian revolution. “The Egyptian people will not accept the laundering of the old regime and presenting it back to them in a new form,” wrote the group in the invitation, explaining that they insist on the complete removal of the remnants of Mubarak’s regime from every institution in the country. No one can deny that the Egyptian revolution inspired the world. To peacefully topple a dictator like Mubarak who ruled the country with an iron fist for 30 years in just 18 days was seen as a miraculous achievement, one that stunned the whole world. And the Egyptians basked in the praise, reminding themselves that they did the impossible. “We were even faster than the Tunisians who needed a whole month to topple their regime,” they said as they nudged each other. But it seems that while the revolution was successful at first, it has begun to burn out. Following the fall of Mubarak, the prosecutor-general announced that Egypt’s former untouchables including Ahmed Ezz, a close confidant of Gamal Mubarak who monopolized the steel industry for years and the detested Minister of Interior Habib El-Adly, would face trial. Assets of former ministers and corrupt businessmen were frozen, the Parliament and Upper House were dissolved as was the state security apparatus and many of its officers were put on trial. But then the situation turned sour. Many of the revolutionary demands were not met, without any satisfactory explanations from either the Armed Forces or the “revolutionary government” of Prime Minister Essam Sharaf. Mubarak has not been put on trial. The National Democratic Party (NDP) is still alive and kicking despite the revolutionaries insisting that it has to be dissolved. The local councils and governors appointed by the old regime have not been replaced; editors of all the national papers, associated and hired by the old regime, remain in their positions; members of the old regime still dominate most workers’ unions and public companies; the emergency law has not been lifted and most political detainees remain in captivity. The shame list does not end there. Members of the old regime, including those the April 6 movement dub the “axis of evil” – Safwat El-Sherif, Zakaria Azmy and Fathi Sorour – have neither been arrested, nor investigated. Reports and eye witness accounts have emerged that the army detained, tortured and even performed virginity tests on protesters seized in Tahrir Square on 9 March. Many of the protesters were then put on trial in military courts and handed prison sentences. Two weeks after Tahrir was cleared by the army, the government approved an anti-strike law banning protests, strikes and sit-ins that “damage the economy” and slamming a one year sentence and fines of up to half a million pounds on protesters. This was followed by a new political parties law, which stipulated that any new political party must have at least 5000 members across ten governorates to be registered, which means that many political parties, still under construction will not be able to recruit enough members in time for the parliamentary elections in September. This, say analysts, means that the next parliament will be dominated by those who are ready, namely the NDP and Muslim Brotherhood, who not only have the numbers but also the presence in the streets and towns of Egypt. The starkest reminder is Tahrir Square; the symbol of the revolution is now empty save for the normal traffic after being filled with millions of protesters. 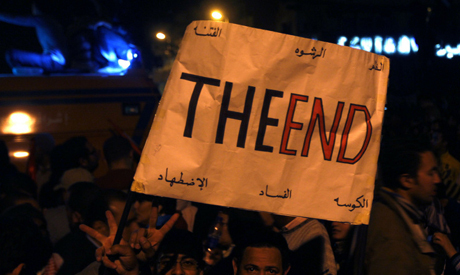 All this has made people ask, has the Egyptian revolution lost steam? Did it speed like a train only to now be stuck in the same stop, unable to move? But, she adds, the revolution is under threat, which is why many activists have put together “Popular Committees to Protect the Revolution” across the nation. Each committee is comprised of the residents from a neighbourhood and works on raising political awareness of the revolution and its goals to galvanise grassroots support. There are currently 40 committees working throughout Egypt and, says Seif El-Dawla, they are organizing a general conference for 22 April to discuss how to maintain the momentum of change. Ahmed Ezzat, a young lawyer who coordinates 25 of those committees, says that the committee has also begun releasing a newspaper called Revolutionary Egypt, with a print run of 50,000 copies per week. “This publication helps us raise awareness of the fact that the revolution is far from over and explain to people how the counter-revolution functions and how they are misled by the state media every day,” says Ezzat. But it’s not just awareness that they want, says Ezzat, but also the support of the people. The idea to create this committee came to him while he was still in Tahrir Square during the revolution. “I met people from different suburbs, cities and workers unions and thought that we need to recruit these people so that when they go back home, they can spread the message of the revolution to their families, neighbours and friends,” explains Ezzat. In fact, it is these people who will keep the revolution alive and kicking, he says. But, says Ezzat, it’s hard enough when the state media is telling the people to back off. The writer and historian Saad Zahran says that one of the problems with the Egyptian revolution is that it is not “owned by anyone.” It was not triggered by a political party, a secret organization, or pushed forward towards a specific political ideology. It was, as most Egyptians will proudly tell you, a mass uprising that did not leave out any political factions. Indeed, while Egyptians made a show of unity to the world during the revolution, now everyone is at loggerheads about what to do next. The 19 March referendum on constitutional amendments laid these differences out in the open. The Muslim Brotherhood, which actively participated in the protests in January, campaigned heavily for a “Yes” vote during the referendum, while the rest of the political parties and groups were against the proposed amendments. The referendum also opened up sectarian divides; many Christians hoped for a “No” vote, in opposition to Salafists and supporters of the Brotherhood. Political scientist Emad Gad says that the military council rejected a plan presented by the country’s intellectuals to slowly ease the country towards democracy by creating a presidential council made up of two military officials and a civilian, and appoint a constituent assembly to write a new constitution before holding parliamentary and presidential elections. All this, adds Gad, coincided with a public relations campaign, aimed at scaring the public into following the council’s plans without objecting. The release of the Islamic Jihad member Aboud El-Zomour, who was convicted for the assassination of President Anwar El-Sadat, from prison and his subsequent appearances on television, the video of Sheikh Hussein Yaqoub, a famous Salafist cleric, who described the ballot boxes as “ghazwa” (a term used during the era of Prophet Mohamed to describe a battle) and calling anyone who voted “No” a kafir (infidel), were all in sync with the plans of the military council, says Gad. “Why did they let El-Zomour say on national TV that he wants to cut people’s hands and legs off, why did the video of Yaqoub go viral on the internet?” asks Gad. Another suspicious issue is the sudden appearances of Salafists and reports of them attacking Christians which began spreading shortly after the revolution, a big blow to the protesters who claimed that national unity was one of the main values of January 25. Last week, it was reported that Ayman Mitri, a Coptic school teacher in Qena,had his ears cut off by Salafists who accused him of running a prostitution ring. On Monday, a text message was sent to women across the country, warning them that the next day, “Salafists will hold protests in streets and squares and have said that they will kidnap any woman who is not wearing a veil,” and went on to warn women to stay home. Though worrying, according to analysts, there is no need to fret. The supporters of the revolution may have lost some battles, but the war is far from over. Amr El-Shoubaki, a senior analyst at the Al-Ahram Center for Political and Strategic Studies, says that the battle has simply changed its form and moved from Tahrir Square to other arenas. Egyptian workers, forbidden from creating independent unions since 1952, are now organizing unions to speak in their name to demand their rights. But, says Kamal Abbas, the general co-ordinator for the Centre for Trade Union and Workers Services (CTUWS), the workers themselves are facing their own counter-revolution. After Mubarak stepped down, workers across Egypt held strike after strike, often curtailing the production of their factories and companies. The proliferation of independent unions, even among previously unsyndicated professions such as barbers and salesmen, proves to Abbas that things are changing. Last Friday, activists and political groups called for a million man march in Cairo to protest the anti-strike law, but only a few thousand turned up in front of the Radio and TV headquarters in Maspero. As several army officers monitored the protests, one protester began chanting the popular slogan during the revolution of "the people and the army are one hand." This time, however, he was booed and people screamed "not anymore." Now on Friday, it will become clear if the Egyptian revolution is still on or not. Activists are calling for millions to join in and if they do, it will be the first official face-off between the people and the army.